Going bald and receding hairlines, these are nightmares for a lot of men. All over the world hair transplantation is very popular as a permanent solution for hair loss at the moment. ISHRS (International Society of Hair Restoration Surgery) has declared that, based on last year’s member survey, the year 2016 showed a 60% increase compared to 2014, in surgical hair restoration procedures performed worldwide. 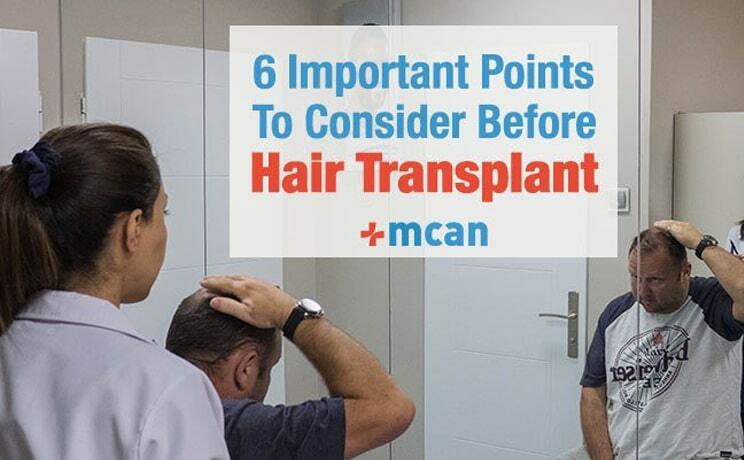 For men who have a hair loss problem and decide to undergo hair transplantation, there are 6 important points that should be considered in the process of making the decision; where to have a hair transplant and when to have it? Hair loss is a two-way treatment: Keeping the existing hair healthy and restoring the lost hairs. You may start your hair loss treatment with some medicines such as Minoxidil (brand name Rogaine) and Finasteride (brand name Propecia). Surely, you can use them and they may work. But, in most of cases, as soon as you stop using Minoxidil, you may experience a severe loss of hair. On the other hand, because Finasteride can have a negative side effect regarding sexual power, generally men do not prefer it to use for a long time. Still, these are two common medicines and are effective in preventing hair loss. Before you come to MCAN Health for a hair transplant in Turkey, our surgeons will ask you to stop using Minoxidil at least 3 months before the hair transplant procedure. Because in order to make the right planning, they want to observe the effect on your balding and receding parts after you stopped using Minoxidil. After hair transplantation, surgeons may advise you to use Minoxidil and Finasteride for a short period to keep your natural hair located among the transplanted hairs healthy. Hair transplantation is not happening by extracting the hair follicles from someone who has a lot of hair and then these hair follicles from someone transplanted to you. It is happening by harvesting hair follicles from your own donor area (the back of your head) and then implanting them to your balding parts. So, your own situation determines what is possible for you. Don’t expect any miracles! And don’t trust those who promise you a head full of hair when your donor area has only limited possibilities and when you have large balding parts. The cost of hair transplantation varies from country to country. In Europe, the costs of an FUE hair transplantation vary from 3,000 EUR to 30,000 EUR whereas in the USA the prices are starting at 3500 EUR up to 35,000 EUR, depending on the implanted number of follicles, the clinic, and the location. In both Europe and the USA, FUE hair transplantation clinics offer the price per graft (follicles), so the cost of a patient with 3000 grafts can go up to 20,000 EUR. The cost of FUE hair transplantation in Turkey starts at 1,500 EUR and go up to 6,000 EUR for 3,000 follicles. In Turkey, most of the clinics work with the maximum number of follicles possible in one session. Many patients have their hair transplant in Turkey, attracted by the huge price difference and the surgeons’ quality, making Turkey a hit destination for hair transplant. When you decide on the country and then the clinic, do not go for the cheap one but for the reasonable, trusted, legal and audited one with reputable surgeons. 4) Which kind of hair transplantation? FUE, FUT, DHI, Percutaneous? Hair Transplantation has 3 main stages: Extraction, Canal Opening, Implantation. FUE means to extract each and every hair follicle one by one, whereas FUT means to extract a strip of hair at the back of the head. Since FUT leaves a scar, it is not preferred anymore. Many surgeons proceed with the FUE in order not to create a scar. Canal Opening and Implantation are the other important phases of hair transplantation. In FUE, canals are opened with the so-called slit method and implanted one by one. In DHI (Direct Hair Implantation), a special pen is used to open the canals and at the same time to implant the grafts. There are some advantages of DHI in comparison to FUE. Please read DHI vs FUE for further information. Percutaneous is another canal opening method where the canals are opened in a circular shape. Which method is most suitable for you is determined together with your surgeon on the basis of your expectations and the possibilities of your donor area, the quality of your hair follicles and the extent of the balding parts. You will need one day for the whole procedure. It will take 6-8 hours. However; it is better if you get three-day permission from your work because your first check-up will take place after one or two days. And there may be some swellings on your face and head. They will be reduced by then. You should remember that the transplanted hair follicles are very vulnerable for at least 10 days. So, you need to protect your head from any possible damage, you shouldn’t wear any helmet, you must sweat as little as possible and you shouldn’t do any heavy exercise. Choosing the right and the best clinic is difficult. 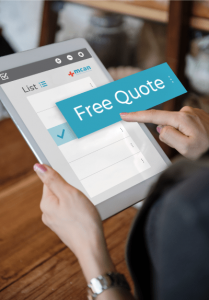 There are a lot of things you will look into, such as the pictures of previous patients, reviews, the consultation process, the after-care process and the qualifications of the surgeon. If you go abroad, you have to determine if things such as accommodation, transfers between clinic-hospital-airport, an interpreter, 7/24 support during your stay, are also being arranged. We already mentioned that hair transplantation is a one-day procedure but seeing the result is one year. A clinic abroad should follow your case if everything goes fine and as expected and if something goes wrong should direct you correctly and on time. Do you think 23 is too young for hair transplant? Can I have a professional idea? Very informative by the way. Those medicines are not legit at all. mcanhealth.com to get in contact with our expert team who can answer all your questions in terms of scientific analysis. Thank you Delair. You can always ask any question you want to us. In point 2 you mention stopping using minoxidil then starting again to keep the natural hair healthy with the transplanted hair. Surely when you stop using the minoxidil again your natural hair will continue to recede and leave the transplanted hair looking like thinning hair again? Your comments about donor hair quantity is spot on. If there isn’t enough donor hair you may not get the results that match your expectations.